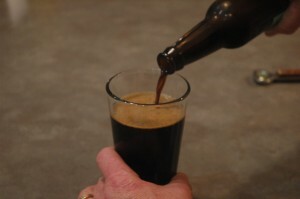 This recipe has brewed for the 2009 National Teach-A-Friend-To-Brew Day. I like malt forward beers. This beer is a big malty beers with lots of mouthfeel and a bit a residual sweetness. It comes across as having chocolate and coffee notes with some caramel. The fermentation leaves some fruit notes like plum. Not much head retention at this point, but that may change as the beer conditions. This recipe is from Brewing Classic Styles by Zamil Zainasheff & John Palmer. Mashed at 149° F for 60 minutes. Fermented at 65 °F (a little warmer might be good). Carbonated to 1.5 to 2 volumes CO2.